Catalysts are substances that reduce the activation energy of a chemical reaction, facilitating it or making it energetically viable. The catalyst increases the speed of the chemical reaction. 2. What amount of catalyst is consumed in the reaction it catalyzes? 3. Is there a difference between the initial and the final energy levels in catalyzed and non-catalyzed reactions? The catalysis does not alter the state of the energy of the reagents and products of a chemical reaction. Only the energy necessary for the reaction to occur, that is, the activation energy, is altered. 4. What are enzymes? What is the importance of enzymes for living beings? Enzymes are proteins that are catalysts of chemical reactions. Chemistry shows us that catalysts are non-consumable substances that reduce the activation energy necessary for a chemical reaction to occur. Enzymes are highly specific to the reactions they catalyze. They are of vital importance for life because most of the chemical reactions in cells and tissues are catalyzed by enzymes. Without enzyme action, those reactions would not occur or would not happen with the required speed for the biological processes in which they are involved. 5. What are substrates of enzymatic reactions? Enzymes have spatial binding sites to attach to their substrate. These sites are called the activation centers of the enzyme. Substrates bind to these centers, forming the enzyme-substrate complex. 6. What are the main theoretical models that try to explain the formation of the enzyme-substrate complex? There are two main models that explain the formation of the enzyme-substrate complex: the lock and key model and the induced fit model. In the lock and key model, the enzyme has a region with a specific spatial conformation for the binding of the substrate. In the induced fit model, the binding of the substrate induces a change in the spatial configuration of the enzyme to make the substrate fit. 7. How does the formation of the enzyme-substrate complex explain the reduction in the activation energy of chemical reactions? The enzyme possibly works as like a test tube within which reagents meet to form products. Enzymes facilitate this meeting, making it easier for collisions between reagents to occur and, as a result, the activation energy of the chemical reaction is reduced. This is one possible hypothesis. 8. On what structural level of the enzyme (primary, secondary, tertiary or quaternary) does the enzyme-substrate interaction depend? 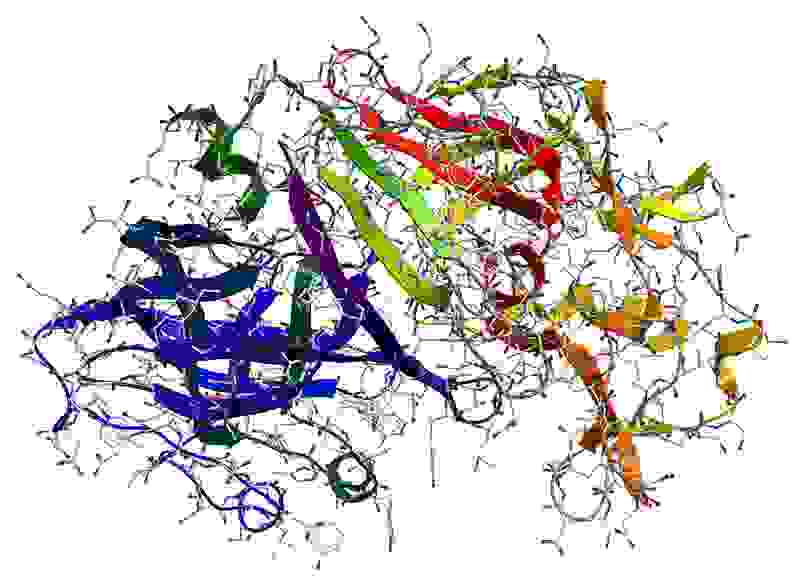 The substrate binds to the enzyme at the activation centers. These are specific three-dimensional sites and therefore they depend on the protein's tertiary and quaternary structures. The primary and secondary structures, however, condition the other structures, and consequently are equally important. 9. What is the activation center of an enzyme? Is it the key or the lock in the lock and key model? The activation center is a region of the enzyme produced by its spatial conformation to which the substrate binds. In the lock and key model, the activation center is the lock and the substrate is the key. 10. Why enzyme action is considered highly specific? Enzyme action is highly specific because only the specific substrates of an enzyme bind to the activation center of that enzyme. Each enzyme generally catalyzes only one specific chemical reaction. 11. What happens to the functionality of a denatured enzyme? How can that result be explained with the help of the lock and key model? According to the lock and key, enzyme functionality depends entirely on the integrity of the activation center, a molecular region with specific spatial characteristics. After denaturation, the spatial conformation of the protein is modified, the activation center is destroyed and the enzyme loses its catalytic activity. 12. What are the main factors that alter the speed of enzymatic reactions? The main factors that change the speed of enzymatic reactions are temperature, pH and substrate concentration (quantity). 13. How does substrate concentration affect the speed of enzymatic reactions? Initially, as substrate concentration increases, the speed of the reaction increases. This happens because free activation centers of the enzyme bind to free substrates. Once all the activation centers of the available enzymes are bound to their substrates, new increases in the substrate concentration will have no effect on the speed of the reaction. 14. How does temperature affect the action of enzymes on their substrates? There are defined temperature ranges under which enzymes operate and there is a specific temperature level (optimum temperature) in which enzymes have maximum efficiency. Therefore, temperature variations affect enzyme activity and the speed of the reactions they catalyze. In addition, because they are proteins, enzymes can be denatured under extreme temperatures. 15. Concerning enzymatic reactions, how different are the curves of the graph of the variation in the speed of a reaction as function of substrate concentration and the graph of the variation in the speed of a reaction as function of temperature? The curve of the variation in speed of the enzymatic reaction as a function of increasing substrate concentration increases in a curve formation until approaching the point where it stabilizes due to the saturation of the activation centers of the enzymes. The curve of the variation in the speed of the enzymatic reaction as a function of increasing temperature initially increases and then reaches a peak (the optimum temperature), after which it decreases to zero at the point in which the enzymes are rendered inactive by denaturation. 16. What is the relationship between the cooling of organs and tissues for medical transplants and the effect of temperature on enzymatic reactions? Molecular degradation during the decomposition of organs and tissues is catalyzed by enzymes. The cooling to adequate temperatures of some organs and tissues destined for transplantation reduces that enzyme activity and thus decreases the natural decomposition process. By the same rationale, the cooling reduces the metabolic work of cells and prevents the breakdown of their own structures to obtain energy. A subsequent increase in temperature reverts the denaturation of enzymes, allowing the organs and tissues also preserved by other specific techniques to be grafted into the receptors. 17. Does pH affect enzyme activity? The concentration of hydrogen ions in a solution affects enzyme activity. Each enzyme has a maximum efficiency in an optimum pH. Since pH is one of the factors in the denaturation of proteins, if an enzyme is subject to a pH level under which it is denatured, there will be no enzymatic activity. 18. Do enzymes act better under acidic or alkaline pHs? Most enzymes act under pHs between 6 and 8, a range that corresponds to the general acidic level of cells and blood. There are enzymes, however, that act only under very acid or very alkaline pH. Therefore, enzyme activity depends on pH range. In the stomach, for example, gastric juice has a very low pH, around 2. Nonetheless, the enzyme pepsin acts to intensively digest proteins. In the duodenum, pancreatic secretions increase the pH of the intestinal juice to allow other digestive enzymes, such as trypsin, to act. 19. Since pepsin is a gastric enzyme, does it have an acidic or alkaline optimum pH? What happens to pepsin when it enters the duodenum? Pepsin acts within the stomach so its optimum pH is around 2, an acidic pH. When the enzyme enters the duodenum, it comes in contact with a higher pH and its enzyme activity comes to and end. 20. What are enzyme cofactors? Some enzymes need other associated molecules to work. These molecules are called enzyme cofactors and they can be organic ions like mineral salts, or organic molecules, to give some examples. Inactive enzymes which are not bound to their cofactors are called apoenzymes. Active enzymes bound to their cofactors are called holoenzymes. 21. What is the relationship between vitamins and enzyme cofactors? Many vitamins are enzyme cofactors that cannot be synthesized by the body and, as a result, must be obtained from the diet. 22. In a enzymatic reaction, what is the effect of a substance with the same spatial conformation as the enzyme substrate? How is this type of substance recognized? Substances that “simulate” substrates can bind to the activation center of enzymes, thus blocking the true substrates from binding to these enzymes and paralyzing the enzymatic reaction. These “fake substrates” are called enzyme inhibitors. The binding of enzyme inhibitors to enzymes can be reversible or irreversible. Many medical drugs, including some antibiotics, antivirals, antineoplastics, antihypertensives and even sildenafil (trade name Viagra), are enzyme inhibitors that block enzyme activity. 23. What is the mechanism of action of the antibiotic penicillin? Penicillin, discovered by the Scottish doctor Alexander Fleming in 1928, is a drug that inhibits the enzymes necessary for the synthesis of peptidoglycans, a component of the bacterial cell wall. Through this, the inhibition the bacterial population stops growing because there is no new cell wall formation. Fleming won the Nobel Prize in medicine for the discovery of penicillin. 24. What is the mechanism of action of the antiretroviral drugs called protease inhibitors which are used against HIV infection? Protease inhibitors are some of the antiretroviral drugs used to treat HIV infection. Protease is an enzyme necessary for the construction of the human immunodeficiency virus (HIV) after the synthesis of its proteins within the host cell. The protease inhibitor binds to the activation center of the enzyme blocking the formation of the enzyme-substrate complex and enzyme activity, thus stopping viral replication. 25. What are allosteric enzymes? Allosteric enzymes are enzymes with more than one activation center and to which other substances, called allosteric regulators, bind. Allosteric regulators can be allosteric inhibitors or allosteric activators. The interaction between an allosteric enzyme and an allosteric inhibitor prohibits the binding of the substrate to the enzyme. The interaction between an allosteric enzyme and an allosteric activator allows the binding of the substrate to the enzyme and sometimes increases the affinity of the enzyme for the substrate. This regulatory phenomenon of enzyme activity is called allosterism. Zymogens, or proenzymes, are enzymes secreted in inactive form. Under certain conditions, a zymogen changes into the active form of the enzyme. In general, zymogen secretions happen because enzyme activity can harm secretory tissue. For example, the pepsinogen secreted by the stomach becomes active under an acidic pH, turning into the enzyme pepsin. Other well-known zymogens are trypsinogen and chymotrypsinogen, enzymes that are secreted by the exocrine pancreas and which become trypsin and chymotrypsin respectively. Study the next subject: go to Nucleic Acids.